Universal, Sony and Warner’s record labels turned over more than $1bn from streaming in the first quarter of this year – generating nearly $150 from the likes of Spotify and Apple Music every single second. Like, literally – chuck in some extra waffle between parenthesis here to postpone your arrival at the next full stop – and they’ve already earned $2,000+ just in the time it’s taken you to read the past two sentences. According to MBW analysis, the trio of companies’ recorded music divisions cumulatively generated $1.13bn from streaming in the three months to end of March. Universal Music Group claimed a 44% market share of this money, thanks to the €467m ($498m) it earned from streaming in the period. As a result, UMG enjoyed its biggest Q1 in 15 years in the quarter, with streaming contributing 46% of total revenues. Sony Music turned over 37.79bn Yen ($332m) in streaming revenues in calendar Q1 2017, grabbing a major label market share of 29%. And Warner punched above its weight with $300m in streaming cash – representing 27% of the total pie. 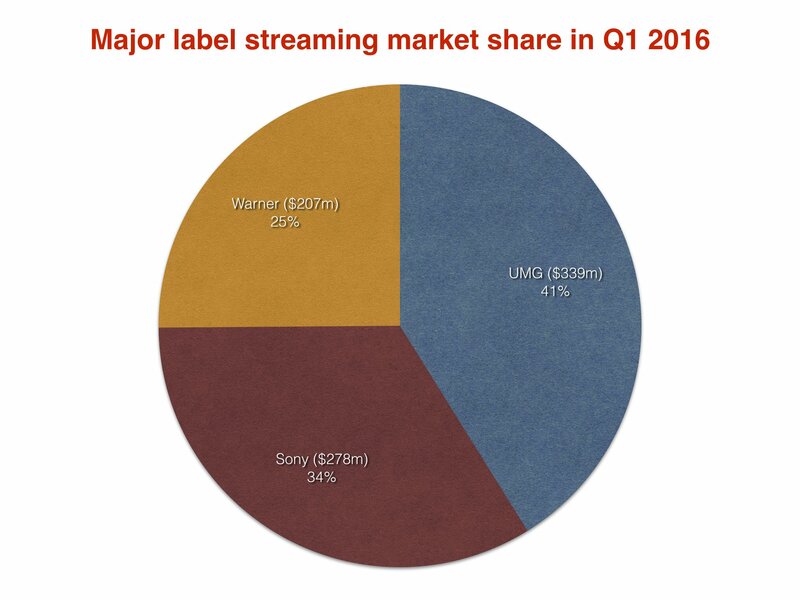 Interestingly, MBW estimates that UMG, Sony and Warner turned over $824m in streaming revenue in the same period of the prior year (Q1 2016). UMG had a smaller market share of 41% (€307m / $339m), with Sony on 34% (32.02bn Yen / $278m). US-based Warner’s steaming haul in the first quarter of 2016 was officially $207m, representing a 25% share amongst the majors. That all essentially means Universal has grown its global Q1 major label streaming market share by 3% over the past year, with Warner’s climbing by 2%. Most importantly, the overall first-quarter streaming revenues flowing into all of the majors have grown by 37% – or $306m – in the past year. So how big was the total recorded music streaming market in Q1 2017 – including the independent sector? Take this as a rough estimate, but somewhere in the region of $1.5bn. To get to that figure, we’ve used Music & Copyright’s recent estimate that the indies claimed a 24.4% market share of global digital recorded music revenues in 2016. Some fun guesswork: considering that 2017’s quarterly streaming hauls will – barring a miracle – continue to grow at a pace throughout this year, it’s fair to forecast that the global industry’s total annual recorded music streaming revenues should top $7bn by the end of 2017. That would have made up 45% of last year’s overall global market revenues of $15.7bn.